Tokyo, Japan, December 16, 2008 --(PR.com)-- A new agreement has recently been concluded between d-rights Inc., an integrated production company based in Japan handling entertainment contents in animation and live-action films around the world, and NewBoy FZCO, a company based in Dubai engaged in the development, marketing and distribution of various toys, food, textile and stationery products. The two companies will be co-producing a new TV animation in 52 episodes, 30 minutes each. The new animation is targeted to boys 4-12 years old and is based on a totally new toy concept. "We are very excited by this project and honored to partner with NewBoy, the leader in the Middle East toy industry. NewBoy’s toy production team is known for its talent and by integrating our animation team’s skill and experience, we are confident that this project will be a worldwide success," said Daizo Suzuki, COO, d-rights. "This is our first official venture in the international market. We have created a new product concept, partnered with one of the leading Japanese companies in the industry and are capitalizing on our credibility with all major toys distributors. This has enticed the interest of many international companies with whom negotiations have already started to be part of this venture. This is a strategic project for us and we are confident of its success," said Manar Tarabichi, CEO, NewBoy FZCO. 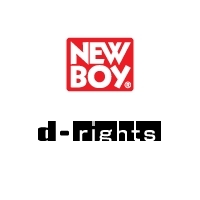 d-rights Inc., a wholly owned subsidiary of Mitsubishi Corporation, is an integrated production company planning, producing and licensing animation and live-action contents in Japan and around the world. Headquartered in Tokyo, the company has been successful in producing TV animation series that became worldwide success, such as “Beyblade” and “Battle B-Daman” series. NewBoy FZCO is the leader in the Middle East toy market engaged in the development, marketing and distribution of various toys, food, textile and stationery products. The company also acquires, sells, and markets licenses for some of the hottest cartoon characters throughout a number of product categories. Headquartered in Dubai, UAE, the company has direct operations in GCC, Levant, and North Africa, in addition to India and Indonesia. NewBoy represents famous international toy brands and has its own portfolio of private label brands including Fulla (the number one fashion doll in the Middle East), Fun to Learn, Baby Habibi, Arabian Friends, Baby's In 2 Fun, and Play Time. For more information, please send your request to: info@newboy.com.